Something I simply love in a house is the breakfast nook. I like the white/yellow/blue combination. It makes me feel quite and peaceful: an excellent start for the new day! 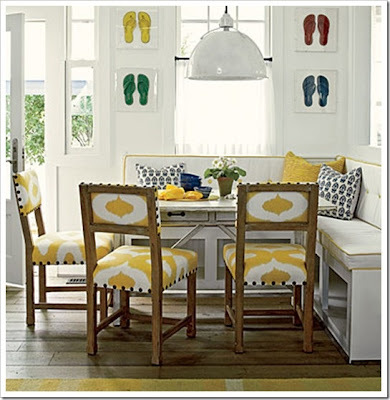 The flip flop wall arts give a touch of summer time: perfect for those houses near the coast (erhm.. mine for example). White and Blue combination! This breakfast nook is small but looks very intimate and comfy. I like that the table is surronded by windows: imagine having brekfast while looking at a nice and sunny day. Wouldn't you like to have breakfast here? I like the green walls and white table, the bench under the windows and the fact that the pillows match perfectly. I would perfectly see this breakfast nook in a countryside house :) I like the way the colors have been mixed together and all the details that makes it rural and delicate. 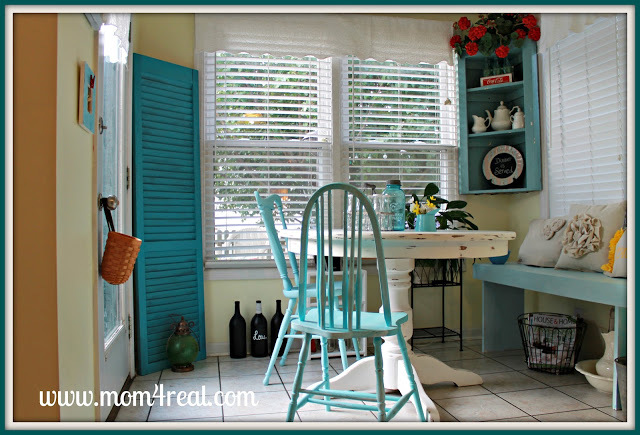 Do you like my breakfast nook and the ones I get inspired from?